PETALING JAYA, 12 January 2017 – Jaguar Land Rover (Malaysia) has rolled-out the new Discovery to the Malaysian market today. The fifth-generation model benefits from Land Rover’s strong, safe and light full-size SUV architecture, delivering comfort and adaptability like no other. The new Discovery redefines the large SUV, which has been revolutionised to create a highly desirable, extremely versatile and hugely capable premium SUV. It also embodies Land Rover’s drive to go Above and Beyond, combining British desirability with an unstoppable spirit of adventure. This three-row, seven-seat SUV that measures 4,970mm long, 2,220mm wide (mirrors out) and 1,846mm tall, is the ultimate family and active lifestyle companion. The Discovery’s trademark stadium seating is accommodated by its distinctive stepped roof that ensures all passengers enjoy excellent forward visibility and unrivalled long-haul comfort. The new Discovery also offers the driver, driving confidence due to the raised Command Driving Position, simple controls and enhanced chassis technology. Apart from that, it is also equipped with InControl Touch Pro, which provides greater connectivity than ever before including access to a range of apps, satellite navigation as well as vehicle controls through the updated 10-inch high-resolution touchscreen display. The Powered Inner Tailgate is another great innovation that is offered with the new Discovery. This neat innovation incorporates an additional fold-down section that deploys when the tailgate is opened. A button inside the load area can then be used to lower the Powered Inner Tailgate section. The deployed 285mm long tailgate serves as impromptu event seating and is able to support a maximum load of 300kg, making it the perfect place to enjoy a tailgate picnic or to change out of muddy boots – all under the shelter of the tailgate. Powered by a 258PS 3.0-litre V6 diesel engine, badged Td6, the single-turbo engine features low-pressure exhaust recirculation, a two-stage oil pump and revised fuel-injector nozzle for improved responses, refinement and efficiency. The 258PS engine delivers stronger performance than before and the benchmark 0-100km/h sprint takes only 8.1 seconds – a reduction of 1.3 seconds. With a significant 600Nm of torque on offer, the new Td6 diesel delivers relaxed cruising refinement and towering all-terrain capability. Coupled with the Td6 diesel engine is the ZF eight-speed automatic gearbox, which has been engineered by the powertrain experts at Land Rover to combine smooth shifts with sharp responses and optimized fuel efficiency. The gearbox is controlled using the rotary gearshift controller that rises from the center console, while manual changes can be prompted with the use of the steering wheel-mounted shift paddles for dynamic driving and precise control when completing off-road maneuvers. For the ultimate all-terrain capability, the new Discovery is offered a two-speed transfer box, providing selectable high and low range gears for optimum on-road and off-road performance. The intelligent system provides a standard 50/50 torque split between front and rear wheels, while the two-speed fully synchronised ‘shift on the move’ system allows the driver to swap between high and low ratios without having to stop the vehicle, at speeds of up to 60km/h. In addition, an available four-corner air suspension system in the new Discovery that improves ride quality when driving on-road also provides greater capability when off-roading. In terms of design, the new design of the Discovery features optimised proportions, combined with beautiful detailing as well as enhanced precision to create a highly capable and versatile SUV with a more dynamic design than before. At the front, the new Discovery’s sculpted surfaces, jewel-like headlamps and a faster windscreen angle break the Discovery tradition and the state-of-the-art daytime running lamps deliver a modern appearance with a distinctive new light signature. At the back, the LED rear lamps have a horizontal emphasis, giving New Discovery a more sporty appearance, while the new one-piece tailgate delivers a more dynamic rear design. 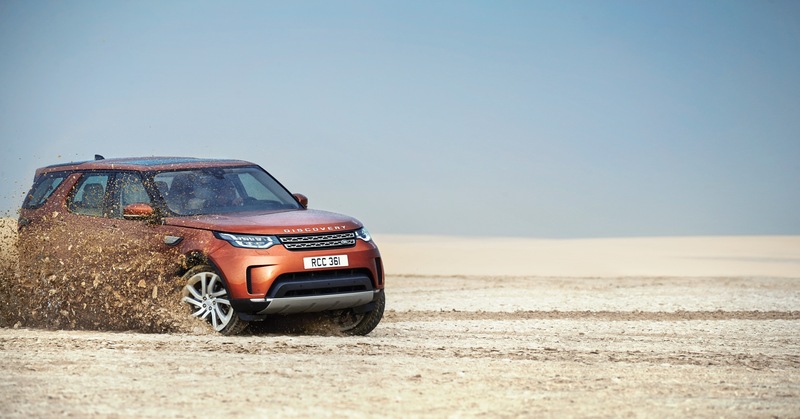 “The new Discovery builds upon the practicality and versatility of its predecessor, offering the same supreme breadth of capability that only a Land Rover can. Pioneering technologies, lightweight aluminium architectures and advanced powertrains ensure that the new Discovery appeals to consumers of multiple levels,” said Jaguar Land Rover Malaysia Sdn Bhd Managing Director Datuk Aishah Ahmad. Land Rover’s innovative aluminium full-sized SUV platform provides the perfect basis for the new Discovery, delivering a lightweight but durable architecture that contributes to lower CO2 emissions and improved fuel economy, as well as enhancing its dynamic abilities. This lightweight monocoque body construction is made up of 85% aluminium – 43% recycled – and is a significant 480kg lighter than before. The Activity Key, which is offered as an optional accessory is another ‘first’ in the large SUV segment that allows owners to lock and unlock the vehicle without the need to carry a conventional key fob. It is designed as a durable wristband to be worn during outdoor activities. Priced at RM729,800* the new Discovery comes with 5 years warranty and free service as well as 3 years of complimentary roadside assist. *Price is inclusive of 6% GST, excludes road tax, registration and insurance. The first 5 customers to purchase the new Discovery will be given a RM5,000 accessory voucher. Genuine Land Rover accessories are also covered by a 12-month warranty. Accessories fitted within one month or 1,600km (whichever comes first) of the handover of the new Discovery will be covered by the vehicle warranty. In conjunction with the official launch of the new Discovery, Jaguar Land Rover Malaysia will be organizing a ‘Discovery Day’ on January 13 and 14, 2018 at Sime Darby Auto Connexion Petaling Jaya and SISMA Auto Glenmarie and also at SISMA Auto Penang on January 20 and 21, 2018. This exclusive event is by invitation only. Interested customers can call the respective showrooms to register their interest. For more information on the newly launched Discovery, kindly visit www.landrover.com.my or Land Rover Showrooms – Sime Darby Auto Connexion Petaling Jaya (03-7946 3800), SISMA Auto Glenmarie (03-5569 3311) and SISMA Auto Penang (04-226 2279). Jaguar Land Rover is one of the first carmakers in the world to use aluminium extensively in its model range. The company introduced aluminium body structures initially to its Jaguar line, achieving weight reduction of about 40 per cent using stamped panels, castings and aluminium extrusions. The benefits include weight savings, improved fuel efficiency, lower emissions, increased crash safety and improved vehicle dynamics. The use of aluminium continues to grow – from the all-new Range Rover and Range Rover Sport to the exciting new Jaguar F-PACE, as well as the F-TYPE, XE, XF and XJ. The body structure of the XJ, Range Rover Sport and Range Rover is 100% aluminium, the Discovery - 80% aluminium, while the XE and XF is 75% aluminium.